Noble Systems > Blog > Does Gamification really work? How the heck will I know? First, what in the heck is Gami-fi-cation and what is all this excitement about? For all the people “in the know”, congratulations, you have or are going to see the results that you have been hoping for. Now for the ones that have heard of it, but have no idea what it truly means a little hint; the answer is in the word. BINGO!!! Folks, when I talk about Gamification I am talking about using game mechanics to increase productivity, lower attrition, and lower absenteeism, those are just some of the areas that can be impacted. The million-dollar question is, how do game mechanics do all of that? It is actually very simple; gaming gets the employees ENGAGED, especially with the millennials. It is understood that if you are not “into it”, whatever “it” is regardless of the business, one will likely not do it well and some days may just not do it at all. In the call center, the lack of engagement is generally referred to a millennial problem. This is not really a demographic problem, this is just human nature, if you are not excited or interested you will not be motivated to do it. To be honest, we are seeing a major shift in the workplace and disengaged employees are costing businesses millions of dollars. As an example, in the Call Center Industry, replacing a fully loaded agent will cost them $4000-$6000, and with call center agent attrition in excess of 30% it is a major whack to the bottom line. 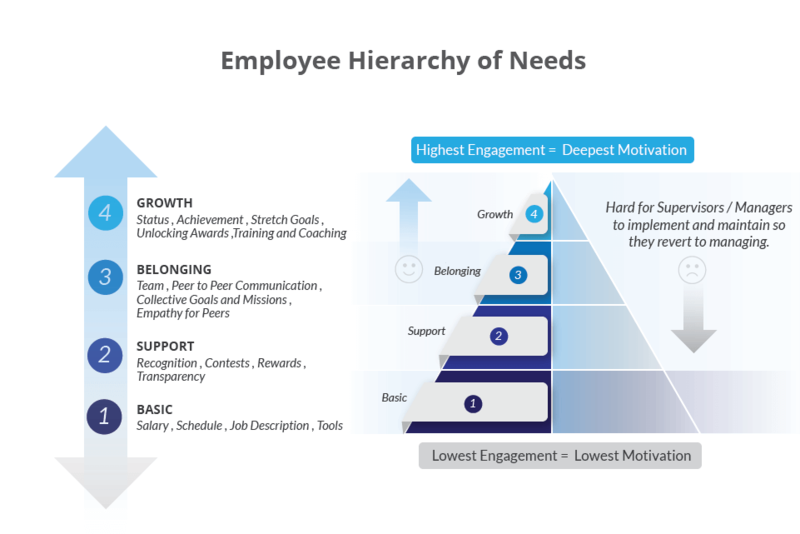 Most everyone is familiar with Maslow’s Hierarchy of Needs, the question is have we spent time analyzing it as it relates to employees in our business. With the “deal with it later mindset”, it has put organizations, “behind the eight ball” who spend most of every day reacting to symptoms of the core issues in the hope of aligning organizational objectives with employee activity. A shift is happening among modern day call centers and it is exciting. There are technology companies, many of whom were employers or even call center managers themselves have started to work the angle. The angle of addressing core issues that create the ugly disengagement symptoms with motivating technology that fluidly fits right into the workplace ecosystem. When looking at adding Gamification to your organization as a way to motivate your team, there are many questions to ask, however none more important than what are the “pain points” that are creating workplace disengagement. Defining Key Performance Indicators (KPIs), that need to be addressed in order to improve employee motivation. It is easy to look at the KPIs and see which are not performing well or need a lift. However, implementing an employee engagement platform and managing it is very difficult, which is why most organizations opt to manage just the very basic employee need; money. Therefore, let’s stop messing around and get serious about change; change in mindset, motivation and employee engagement. Define the KPIs- this is the foundation of the gaming rules and in return this allows the leadership team to communicate the corporate goals to its employees, giving them the feeling that their numbers, their results, and their efforts matter considerably to the company’s overall success. Metric or Performance KPI– understanding what type of KPI you are trying to change, is a direct tie to expectations of time and success. Establish a “controlled group”- this group should be a good mix of your company; gender, tenure, age, top performers versus the bottom 20. Assign each KPI a monetary amount- this allows you to calculate the true ROI, even if one of your KPI is something like attrition or absenteeism, everything you chose has to have a value associated to it and add something to the bottom line. Lastly, you need to consider time, as a way of defining a true ROI on Gamification. Everything you measure takes a different amount of time to see true results, for instance, generally speaking, changing a behavior or increasing customer satisfaction will take longer than a sales lift. Again, this is why it is so important to assign a value to these KPIs, making the employees understand that all KPIs matter and carry weight in the organization.With this being said, a true test of ROI when it comes to Gamification can be determined when not only does behavior change, but that change directly translates to better performance for a sustainable business over an allotted period of time.